I’ve had ambitions towards writing most of my life. I wrote science-fiction short stories as a kid from time to time for my own amusement. I did find them frustrating, unsatisfying. They never quite turned out as well as I imagined they should. I liked to write stories with unexpected endings for school. Typical what-I-did-on-summer-vacation fare, with the last sentence something like, “Then I turned into a wolverine.” This amused my friends more than the teacher. But the urge for writing wasn’t so strong that it shaped what I wanted to do with my life. I haven’t known what I wanted to do, really, for most of my adult years. I went to university and got a degree in psychology, figuring it was more valuable to understand what makes people tick instead of learning how to be an engineer, to mention one alternative. I learned more about rats in psychology at that time and school than about people, I’m afraid to say. Then I thought, what about writing, as a reporter? I went on to more university to study journalism. That didn’t work out so well, either, although I did eventually end up working in one ghetto or another of that field. I still had ideas about stories though. I should be able to write a novel. I read them all the time — science-fiction, modern day thrillers, even an historical novel or two. My big ideas about subjects for novels — almost always science fiction — came to me in the form of settings or milieus. I would start collecting material and background information, but when it came to actually write anything, the lack of any characters to speak of left me completely bogged down, as one might expect. One lengthy period when I was out of work, just as I turned thirty, I did force myself to write a first draft of a novel by slogging through three pages a day, every day. Then the same thing to revise it. It was a non-science fiction story, this time, kind of an adventure/thriller, about an out-of-work character getting into trouble while on a canoe trip around the Bowron Lakes. This is a famous location for canoeing here in British Columbia, a journey over a group of lakes, rivers and creeks that form a rough circle that can be travelled during a week or so. The geography of the location helped give coherence to the structure of the novel’s story, and its grandeur and variety were something to ground and inform the main character. This journey mechanism is a useful one, I would learn later. But at the time I just floundered on with it and got to an end. That effort now sits in a drawer someplace in this house. Again the result felt very unsatisfying. There have been many more ideas since then. Some would take seed and sprout into mind maps of spaghetti notes on a big sheet of paper on the wall. Others might get elaborated in a notebook in the first flush of enthusiasm, before realizing that what I thought could be a story was going nowhere. But now, most recently, I have a science-fiction idea that seemed to come this time with characters dimly attached. It’s become more than just an idea over the last few years, as I collected notes and reference material. But again, just as I started to get going with scenes and world-building, it all bogged down again. I really don’t know how to write a story. The last post or two on this blog have been about my struggle with story, and my efforts to learn more about it. I have no craft. I have read many books on writing that sounded good and were full of advice but gave me no tools. Although probably I wasn’t ready to receive what they did have to offer. But working through John Truby’s book, The Anatomy of Story, I’ve found a guide that I’m actually able to bring to bear on what I want to write. This Time, It’s Going to Work! I’m working through Truby’s 22 steps list — an expanded version of his minimum Seven Story Steps — to build a novel. It’s not like a three-act or any other imposed structure — besides being much more detailed and contoured to every kind of story, it allows creative flexibility. It’s not so much an overlaid scheme, as one that grows out of the characters’ “yearning” (to borrow Robert Olen Butler’s term for the desire lines in a story), and associated obstacles. I’ve got about 25 pages of detailed notes about the wheels and gears of the story itself — what will turn and drive the events of the novel. A kind of story treatment…. This is all new stuff for me — I never had the advantage of having done that kind of work before. Besides that, I’ve come to learn, whether or not it is ultimately true or not, that it is most useful to think about a novel as something that I, the writer, discover. The parts of the world or characters that I don’t know yet, I am beginning to have the confidence that they will reveal themselves, at least partially, as some already have, while I fill in the pieces around them. At the same time, all is in a partially obscuring fog, subject to change. I forget which writer said it, but writing a novel is something like driving down a road in the dark with your headlights on. You can only see a little ways ahead. You can still get to your destination. The thought of world-building, especially in a science-fiction story, can be overwhelming. But I’m coming to realize that only where the world intersects the characters, like a cross-section in an engineering drawing, does it need to be so detailed, and the rest can be alluded to in the background. Specifics can stand for the whole, and they are much more writerly. There are aliens, or at least alien artifacts, in this story. How can one portray the really alien? I haven’t figured that one out yet — or I should say, I haven’t discovered what it might be. Giant ants or robots with laser eyes are so… human. Now, I haven’t actually gotten back to writing the novel yet, after seizing up after getting a few scenes done. The next major job in my preparation is what Truby calls the scene-weave. In some ways again it is like the process that Butler describes that I posted about a number of years ago. It makes me think about learning guitar. I’ve practiced hard and I think I’ve learned a piece. It falls apart when I play along with a backing track or to show somebody. Then I realize I’ve just started the process of learning it. There is much, much more practice necessary. So the novel-writing preparation will go on for a while yet. It’s just that this time, I have real hope of being able to write with somewhere to go. Notes: There is a whole industry built around selling advice to would-be writers. This takes the form of an avalanche of books on writing, magazines and also software which promise to make your novel writing a breeze. I’m tried a couple of the novel-writing programs over the years in my desperate quest. They don’t work very well, because the story that’s going to live for you can’t come from a ready-made scheme or formula. Related to that, but also possibly useful in some ways, are various story-planning worksheets, or beat sheets. These feature various versions of what their authors see as the necessary structure of a story, coded as “beats” or the major plot events that a story must have. Such a beat sheet might have the “Four Major Beats” and the minor beats to fill them out in a table to allow you to script your story events. I’ve also read that editors can spot any story based on these beat sheets a mile away. The method tends to give its products a certain artificiality and sameness. The question is, does Truby’s guide lend this artificial aspect? I don’t think so, although it could degenerate into formula. 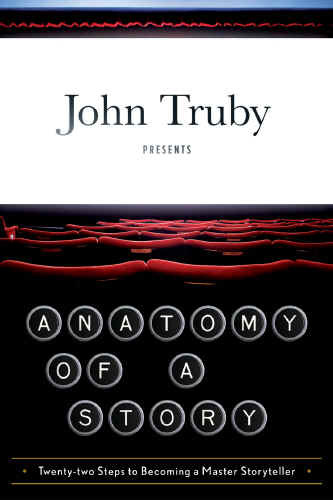 In Truby’s words, he wanted to “lay out a practical poetics — the craft of storytelling that exists in all story forms….